Since its first product in 1917, Nikon has been dedicated to the pursuit of extraordinary optics, pushing the limits of our eyes to thrilling new levels. This past year, with a full century to draw from, Nikon introduced perhaps the most impressive binoculars ever created—the Nikon WX, developed especially for stargazers. With seemingly endless viewing periphery, breathtaking realism all the way to the field edges and unprecedented optical performance, the Nikon WX series is the culmination of 100 years of research, passion and craftsmanship. To celebrate that legacy, Nikon proudly presents 100th Anniversary Editions of the WX 7x50 IF and WX 10x50 IF featuring the 100th anniversary logo, limited edition serial numbers and a commemorative leather strap. Only 100 models (combined) will be produced, making these the binoculars of the century. Not only will this super-wide field of view seemingly transport an entire constellation of crystal-clear imagery to the eyes of the beholder, but it will do so with the amazing realism that has become Nikon’s hallmark for 100 years. The 100th anniversary models bear this commemorative logo. Only 100 models will be made worldwide, between both of the sizes. Don't miss your chance to own this classic piece of Nikon history. 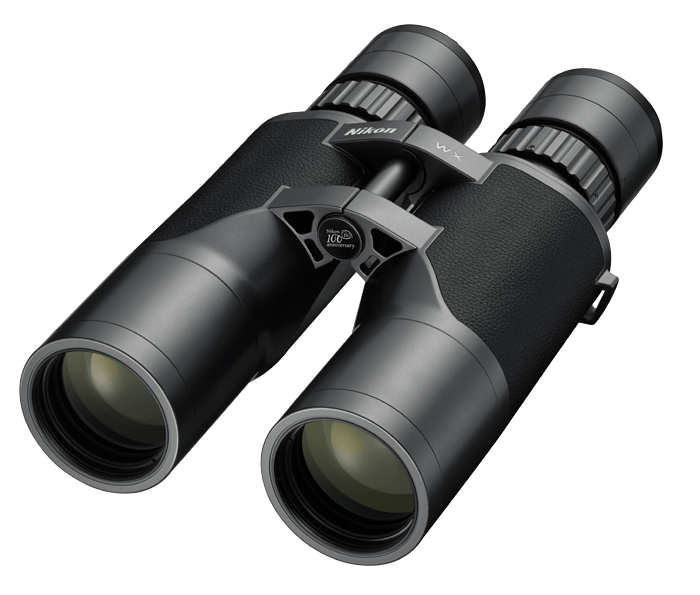 Eyepieces feature unprecedented optical performance and a super-wide field of view. Apparent field of view of 76.4˚. Engineered to minimize astigmatism and coma aberration and provide a sharp and clear image, while the sharpness of the image at the center of the field is achieved all the way to the periphery of the super-wide field of view. The Field Flattener Lens System is employed for compensating curvature of field from the center to the very edge of the periphery, while realizing a super-wide field of view. Assuring a sharp and clear image across the entire super-wide field of view, this lens system allows you to take in a wide-sweeping view of star clusters or galaxies, while individual stars can be clearly seen as sharp points. With such a super-wide field of view, images in peripheral areas would typically become distorted and change noticeably as the binocular is panned. The WX’s unique optical design deliberately retains enough pin-cushion distortion to enable comfortable observation. High-quality multilayer coating, providing uniformly high light transmittance across the entire visible range, is applied to all lenses and prisms to realize a more natural, clearer view. The colors of stars in the night sky are reproduced with fidelity. ED glass elements employed in each tube compensate for chromatic aberration that causes color fringing at the very edge of the field of view. Multiple ED Glass elements result in a contrast-rich and high-resolution image. All lenses and prisms are free of lead and arsenic, under the Nikon Green Procurement Standards. These prisms, which feature total reflection on all surfaces with a high transmission rate, are utilized for a brighter field of view. Phase-correction coatings on roof (Dach) surfaces of these Abbe-Koenig prisms compensate for phase shifts of light when reflecting inside prisms, resulting in high-resolution, high-contrast images and a slim body design. Optical design that realizes both a super-wide field of view and long eye relief. Eyeglass wearers can also enjoy a full, clear super-wide field of view. Rubber eyecups are designed to be removed for cleaning eyepieces. Eyepiece frame is designed in a flat shape for easy maintenance of details. The diopter adjustment ring employs a straight helicoid design. Eyepieces move back and forth in a straight line, and the lenses themselves do not rotate, ensuring the optical axis is not decentered during diopter adjustment. Turn-and-slide rubber eyecups with six-click adjustment facilitate easy positioning and click intervals become finer as the eyecups are extended, for easier adjustment by non-eyeglass users. Waterproof structure that will not be affected if submerged in water to a maximum depth of 16.4 feet / 5 m for 10 minutes. (Not designed for underwater usage). Airtight structure with a nitrogen-filled body that prevents the inside of the optical system from fogging and resists mold even with significant changes in temperature. Wide operating temperature range of -4F to +140F / -20C to + 60c enables use in severe conditions. Magnesium alloy is utilized in body construction, resulting in a sturdy, lightweight body that facilitates handheld viewing. Comes with an exclusive tripod adapter TRA-4. 1/4-in. (ISO1222) tripod screw enables attaching to a tripod. An exclusive case is supplied for storing the WX binocular and accessories.